Select a hyperlink, right click, and select Edit Hyperlink or CTRL + K.
Some documents are used both on the screen and in print. If this is the case for your document and you would like the URL displayed for printing, add the full URL in parenthesis after the hyperlinked text, but do not create a hyperlink. For example: Open the Department of Education website (http://education.state.mn.us). Hyperlink text which is not meaningful, descriptive, and unique needs to be appropriately labeled. For example, a link titled Click Here does not provide enough information to a non-sighted user to understand the link's destination or purpose. In addition to “Click Here,” do not use the following phrases as link text. These phrases are ambiguous when read out of context by a screen reader. Do not capitalize all text in links. Screen readers will then read the words letter by letter. Avoid using URLs as link text. Screen readers will read the URL letter by letter which would be difficult to interpret for a user. Keep link text as concise as possible while still being descriptive. Keep in mind that links could be read out of context by a screen reader, so the link text needs to make sense on its own. 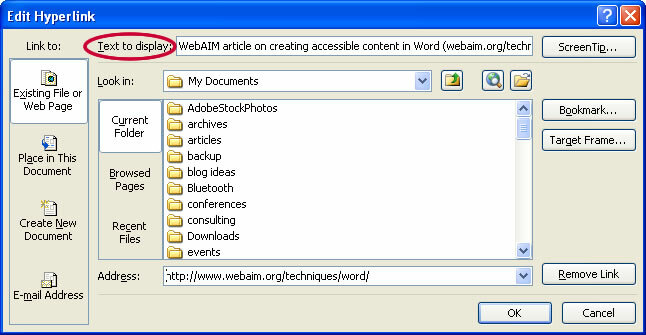 This example demonstrates a good format for a link that is embedded within a paragraph of text within a document such as a memo or on a web page. For additional information, visit the Guidance on APPR Law and Regulations page. This format can be used if you have a list of resources. Avoid: For additional guidance on APPR laws and regulations click here. Avoid: For additional guidance on APPR laws and regulations, please see https://www.engageny.org/resource/guidance-on-new-york-s-annual-professional-performance-review-law-and-regulations.